Pests and Plumbing: How to Protect Your Home from Water-Loving Pests | Imagine Plumbing & Appliance Ltd.
Posted byImagine Plumbing & Appliance Ltd.
No home is completely pest-proof. Although good practices can minimize intruders, many households still rely on professional pest control services to keep insects and rodents of all kinds out. Having a clean, tidy home does not necessarily make it immune to infestations. Pests only need three things to survive: food, water, and shelter. Unfortunately, these conditions are almost always present in your plumbing system. In fact, most plumbing emergency callouts are due to an infestation in the water channels in and around your home. Pests are not a problem for just the rundown or metropolitan areas with low-income residents. Rodents also infest the homes, premises, and buildings of the affluent. In fact, high-income households are more likely to report mice infestations than those with lower annual incomes, which suggests that pests are a common problem for all. The damage caused by pests usually results in expensive repairs for homeowners, especially when it affects the plumbing system. Rodents tend to aggravate plumbing problems and cause a myriad of other issues while roaming in the crawl spaces of the property. Mice can also often block pipes when they get into a building’s plumbing via the sewer system. The factors listed above can make your home very attractive to vermin because they can find whatever they need there; food, water, and shelter. Although properly draining your tub after a bath or your sink after doing the dishes is important, pests and rodents can still find other sources of water within your home that are unknown to you. Leaks can occur anywhere; behind walls, underground, or under your floorboards. Although some of these areas are difficult to access, leaks in such places can still be detected by inspecting your pipes, connected hardware, and the areas around them. 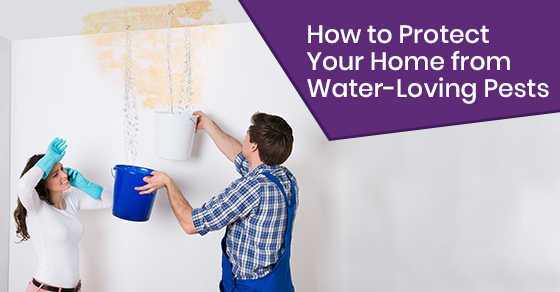 Keep in mind that any water leaks are likely to increase your water bill. So, if the reading is higher than normal, and there were no obvious spillages, you should check your plumbing for leaks. Your entire plumbing system is a point for vermin to potentially access water, from the taps to the garden hose, to the sewage line. Just as plumbing issues tend to attract pests, pests can also cause damage to your plumbing system and use the pipes to access your home. Plumbing issues and vermin infestation tend to occur at the same time. For instance, burst, cracked, or damaged main sewer lines and drainage lines can allow rats, cockroaches, and other insects and pests to access your home. Backups that occur in your sinks or tub could be a sign of a blockage in your main sewer line, which can cause it to burst and attract vermin. If wastewater stands in your sinks or showers for too long, it could be due to a problem with the drain, such as tree roots, cracks, or channelling. Standing water can also attract vermin into your home. The smell of sewer is a clear indication that your sewer system is compromised. The vent stacks on your roof are designed to contain sewer gas. Any smell of sewer gas is likely due to cracks in the system. If a certain spot on your garden or lawn is greener and healthier than others, it could be because it gets more nourishment than the others. A leaking sewage can act as fertilizer and feed your lawn from under the ground. A busted main line, clogged drain field, or failed septic tank can cause pools of waste to form on the surface. A leaking sewer will continuously saturate the ground around it, causing the soil underneath to weaken and form depressions in the ground. Depending on the proximity of the leak to other structures, it may cause the surrounding ground to sink or develop cracks. You can avoid such problems by performing some proactive maintenance on your plumbing system. Depending on the climate and place you live, the age of your home, type of neighbourhood, and history of pests on your property, you may have a higher risk of pest infestation. If there are pests on your property, you may need to hire a licensed, experienced, and trustworthy pest control provider. Plumbing issues in your home or building should be promptly addressed to prevent rodents from invading your home and causing other problems. If you suspect that pests have clogged your plumbing system, consider hiring plumbing emergency services in Calgary to fix drainage issues and prevent unhygienic disasters on your property. For more information on protecting your plumbing from pests, call Imagine Plumbing at 844-397-2588 or contact us here.